The Senate has voted to confirm former Republican Sen. Chuck Hagel as the nation’s next Secretary of defence by a vote of 58-41.The biggest surprise was Republican Sen. Rand Paul’s vote in favour of confirming Hagel. Other Republicans that joined Paul were Mike Johanns of Nebraska, Thad Cochran of Mississippi, and Richard Shelby of Alabama. Earlier in the day, the Senate voted to end discussion on Hagel’s nomination and move proceedings to a final vote. Hagel’s confirmation came after Republicans put up a long fight before and after Hagel’s at-times disastrous confirmation hearing. Nearly two weeks ago, Republicans prevented confirmation from moving forward before the Senate recessed, drawing the ire of the White House and Democrats. But the most noteworthy item that came from the delay in Hagel’s confirmation was the discovery that a New York Daily News reporter had inadvertently started a rumour that was being used as a major argument against his appointment. 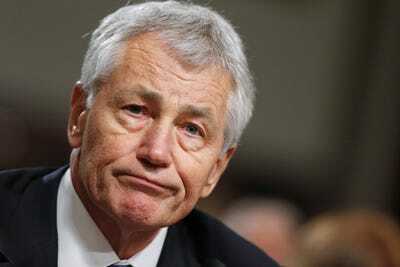 One of Hagel’s first jobs upon being sworn in — which is expected to happen Wednesday — will be dealing with the looming, across-the-board cuts of the sequester set to slam the defence Department. It will have to deal with $46 billion in cuts through the remainder of the fiscal year. With the bipartisan confirmation of Chuck Hagel as our next Secretary of defence, we will have the defence secretary our nation needs and the leader our troops deserve. From the moment he volunteered for military service in Vietnam, Chuck has devoted his life to keeping America secure and our armed forces strong. An American patriot who fought and bled for our country, he understands our sacred obligations to our service members, military families and veterans. I will be counting on Chuck’s judgment and counsel as we end the war in Afghanistan, bring our troops home, stay ready to meet the threats of our time and keep our military the finest fighting force in the world. Most of all, I am grateful to Chuck for reminding us that when it comes to our national defence, we are not Democrats or Republicans, we are Americans, and our greatest responsibility is the security of the American people.